Ever struggled to create a 3D model from a dxf file in Creo Elements/Direct (formerly CoCreate)? Ever wanted to try create an exploded view in Creo Elements/Pro (Formerly ProEngineer)? 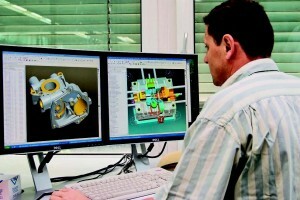 PTC have recently opened the Learning Exchange. LearningExchange is the go-to place for free tutorials on PTC products. PTC University developed this new web app to provide you with direct access to free tutorials created by PTC product experts who want to share their knowledge with you and make it easy to find the training you need when you need it. Just sign in (it’s free!) to track your history and rate tutorials and more. Using video, text and images, or all three, tutorials are targeted on a single task and are a great way to explore the capabilities of your PTC products. Experts from the PTC Universtiy and the product development team at PTC, as well as users from around the globe can share brief tutorials and how to guides on any of the Creo applications (Elements/Pro – Formerly ProEngineer, Elements/Direct – Formerly CoCreate and Elements/View – Formerly ProductView), as well as Arbortext, Windchill or Mathcad. If you can’t find what you are looking for, or require training on any of the products mentioned then we can offer tailored training on all the PTC products listed above. For further information, please contact the office.